PAMTM3000 uses our unique patent pending technology to allow bed occupancy and vital signs monitoring of patients in ElderCare and HealthCare facilities. HealthCare facilities can treat their patients knowing that there is now a way to conveniently and efficiently monitor bed occupancy and vital signs - with no intrusion or disruption to their patients and disruption of staff tasks. All the while patients are comfortably lying in bed. Should an at-risk patient leave his/her bed unattended, the system detects the non-occupancy status and triggers an alert message to staff. Alerting the staff when at risk patient, identified as requiring assistance, vacates his/her bed helps prevent and greatly reduce injury from falls. ElderCare Centers may also see their insurance premiums go down as a result of being able to monitor patients' vital signs and status and enabling facility staff to instantly respond to patients' falls. This means tremendous cost and resource savings while reducing liability concerns to a long-term care facility. 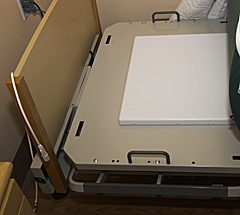 The PAMTM3000 is placed underneath the patient's mattress (no modifications to the bed required) in the facility to monitor individuals when they are in bed. The PAMTM3000 measures an individual's heart rate (beats/min) and respiration rate (breaths/min) and continuously wirelessly relays this information to a monitoring facility, such as a nursing station or directly to staff pagers/wireless handsets. If patient is out of bed for longer than preset time or his/her vital signs are outside of preset range, an alarm indication is sent to the monitoring station or a nurse pager/wireless handset. The monitoring device consists of a UWB (Ultra Wideband) transceiver, a directional antenna, signal processing software and a wireless communication module. The UWB transceiver operates as a motion sensor transmitting extremely low power (thousands times lower than a cell phone) pulses of energy directed toward the patient and receives reflections off the patient's heart and lungs as these organs move. The reflected signals are processed by the digital signal processing software to remove unwanted noise, to extract and separate the heart and respiration signals and to convert them into the digital data that contains information about heart and respiration rates. This data is then sent to a nursing or central monitoring station or nurses pagers/wireless handsets via wireless communication infrastructure. Product brochure and video available upon request.